Yes, I am a birth mother but I am so much more than just that. I am a person who was strong enough to place my child’s needs before my own heart’s desire. My story starts in October 1988 when I was first born. I was born into a family that was struggling in which caused my parents a divorce. My mom packed all our things and moved to Florida in a hope to start a new life. We did not have much, we did have each other. I was just three and my brother was five. At one point my mom came to the decision of letting my brother go back to Texas to be with my dad. It was just me and her. Growing up my mom was never around too much, although we always remained close. My father was there when he was able. I had brothers and sisters in which I never got to grow up with except for in the summer. Those were some of the best days of my life; family dinners around the table, summer nights fishing as a family and then going back to be with my mom at the end of summer. I did not have the picture perfect childhood one who think. My mom was single mom working day and night and was never around. I was always upset and never realized the sacrifices she had to make just for me to play softball and go to my dance recitals. She worked six days a week and twelve hour days. I never really had a mom or a dad because they were working. As I grew into my teen years I promised myself I would never let that happen to my children. I grew into a pretty strong woman because of my mother. She showed me how to fight for anything I want and to never give up. My dad, well he is strong headed man and he always showed me to do everything right from the beginning. Now I am sure you are wondering what any of this has to do with my story. I am a single mother of a beautiful daughter named Arianna. It was an unplanned pregnancy that happened the middle of my partying days. I thought to myself ” Oh no, this can’t be me”. I am only twenty one, I am not married and I just started school. I felt like I was being punished by God. What I did not realize is that God was giving the most beautiful blessing of my life, my daughter. When she arrived everything changed…for the better. The joy of being a mother is the best gift. It is not easy and your job never ends. It is a life time employment. I managed to get by day to day and do what is best for her. The next chapter in my life was coming about rather rapidly and I met someone I soon trusted and fell in love with. I had been in previous relationships one was four years and the other was on and off and I experienced two miscarriages. One of the most devastating feelings I went through. Soon after I placed my trust in the man I thought I loved, I found out I was pregnant. 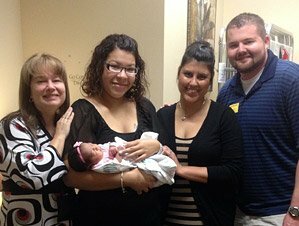 I did not want to be pregnant, I cried and cried. My daughter did not have her father and I did not want my children to go through the same. 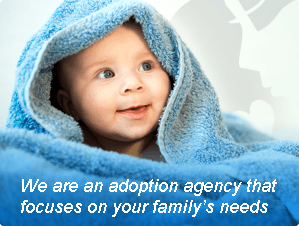 I knew Angela through a friend who was placing from adoption so I contacted her the day I found out and told her I would like to sit down and “do an adoption plan”. I knew in my heart I loved that unborn child as much as I loved my daughter. I did not want them to grow up the way I did, in a home where both parents were absent because one was working all the time and the other was just too far away. I caught my unborn son’s father cheating on me and that made me strong enough to understand what I was doing was the right thing for both my unborn son and my daughter. So many people are uneducated about adoption and have no idea how many families are waiting with the strongest faith that at one point they may get picked. I looked at many profiles and found Karla and Scott when I was 14 weeks pregnant. I knew God brought them into my life and I fell in love with them instantly. They had everything in a family I wish I had growing up. Best experience of my life was when I gave birth to Carter and I helped complete someone else’s family. The love Karla and Scott have for me is amazing and they love my son the same way I do. He now also had a bigger sister named Sophie, she is great. God will bless you when you least expect. My son was born March 1, 2013 and I have days I cry and I have days I rejoice in the fact of what I was able to do so unselfishly for my son. I was blessed with a beautiful son and became a part of someone else’s family. Without the wonderful support Angela and her staff provided, I would never have been able to make it through. Arianna’s dad is now a part of her life and mine as well. We are now a family and living happily. So much has happened in a short time of a few months. I never want my kids to go without. At this point in my life had I kept Carter then he as well as Arianna would have been without me due to me working all the time. That I did not want, so that leads me here.